Engine Timing Belt Kit with Water Pump-Water Pump Kit w/o Seals DAYCO WP337K1A. Marketing Description - 2000 : Dayco(R) Timing Belt Water Pump Kits are manufactured to meet the critical OE quality fit, form and function requirements demanded by both domestic and imported vehicle manufacturers to ensure long lasting peak performance. Country of Origin (Primary) : IT. Harmonized Tariff Code (Schedule B) : 8413309000. Life Cycle Status Code : 2. Product Description - Long - 80 : WATER PUMP KIT, DAYCO. Product Description - Short - 20 : WATER PUMP KIT. See Item Specifics section for additional specifications about this part. To confirm that this part fits your vehicle, enter your vehicle's Year, Make, Model, Trim and Engine in the Compatibility Table. Also review the notes section in the compatibility chart for additional specifications about this part. This part generally fits Hyundai, Kia vehicles and includes models such as Magentis, Optima, Rondo, Santa Fe with the trims of EX Luxury Wagon 4-Door, EX Sedan 4-Door, EX Wagon 4-Door, GL Sport Utility 4-Door, GLS Sport Utility 4-Door, LX Sedan 4-Door, LX Wagon 4-Door, SX Sedan 4-Door. The engine types may include 2.7L 2656CC V6 GAS DOHC Naturally Aspirated. This part fits vehicles made in the following years 2007, 2008, 2009, 2010. Established in 1954, Automotive Supply has been at the nexus of Wichita's automotive aftermarket for more than 58 years. In one location since 1975 our 60,000 square foot facility has what you need. We serve the professional installer as well as walk-in individuals in Wichita and surrounding areas. Portions of the part information on this page have been provided by WHI Solutions, Inc. 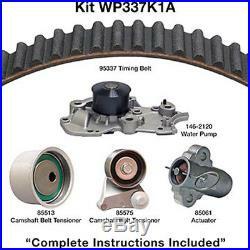 The item "Engine Timing Belt Kit with Water Pump-Water Pump Kit witho Seals DAYCO WP337K1A" is in sale since Monday, July 10, 2017. This item is in the category "eBay Motors\Parts & Accessories\Car & Truck Parts\Engines & Components\Timing Components". The seller is "automotivesupplyinc" and is located in Wichita, Kansas. This item can be shipped to United States, Canada, United Kingdom, Australia, Japan, South Korea, Taiwan, South africa, Thailand, France, Hong Kong, Spain, Italy, Germany, Austria, Russian federation, Israel, Mexico, New Zealand, Philippines, Singapore, Switzerland, Norway, Saudi arabia, Ukraine, United arab emirates, Qatar, Kuwait, Bahrain, Malaysia, Brazil, Chile, Colombia, Costa rica, Panama, Trinidad and tobago, Guatemala, Honduras, Jamaica.